WASHINGTON, Mar 13 2012 (IPS) - Amidst persistent speculation over a possible Israeli military attack against Iranian nuclear facilities in the wake of Prime Minister Benjamin Netanyahu’s visit here, a detailed new public opinion survey released Tuesday suggests that such a move would enjoy little support in the United States. According to the survey by the University of Maryland’s Programme on International Policy Attitudes (PIPA), only one in four U.S. respondents favours an Israeli strike, while nearly seven in 10 (69 percent), including a strong majority of Republicans (59 percent), said they prefer continuing negotiations with Tehran. Only one in seven (14 percent) of the survey’s 727 respondents said they thought Washington should encourage an Israeli attack, while 80 percent said the U.S. should either discourage Israel from taking such a step (34 percent) or maintain a neutral position (46 percent). 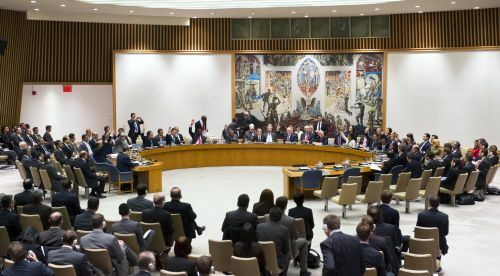 And, consistent with their preference for diplomacy over military action, nearly three out of four respondents, including 69 percent of Republicans, said the U.S. should act primarily through the U.N. Security Council, rather than unilaterally, in dealing with Iran’s nuclear programme. Meanwhile, a second public opinion poll released Tuesday by the New York Times and CBS News found a slight majority (51 percent) of 1,009 respondents who said they would support the U.S. taking military action in order to prevent Iran from developing nuclear weapons. That poll, which did not offer an option for continued diplomacy or negotiations, found that 36 percent of respondents would oppose such a strike. The remaining 13 percent said they were unsure. Asked what the U.S. should do if Israel conducted its own unilateral strike, a 47 percent plurality said Washington should support the Jewish state, 42 percent said it should “not get involved”, and only one percent said the U.S. should oppose it. The two surveys were released just days after last week’s annual policy conference of the powerful American Israel Public Affairs Committee (AIPAC), whose 13,000 activist-attendees were addressed by Netanyahu and President Barack Obama, among other luminaries, before fanning out across Capitol Hill to lobby their elected representatives for a more-confrontational U.S. stance toward Iran and its nuclear programme. Top Israeli leaders, including Netanyahu during his visit here, have been suggesting for several months they were prepared to attack Iran’s nuclear facilities some time this year unless Tehran agreed to abandon its nuclear programme. The Obama administration, on the other hand, has made clear, especially over the past three months, that unprecedented economic sanctions, combined with renewed negotiations with Iran by the so- called P5+1 (U.S., Britain, France, Russia and China plus Germany) should be given more time to reach a diplomatic settlement. Britain and France have also come out publicly during the past week against an Israeli strike. It is not yet clear what was the impact, if any, of the AIPAC conference on popular attitudes. On the one hand, the results in the Times/CBS poll – which was conducted over four days (Mar. 7-11) immediately after the conference – about U.S. military action against Iran were essentially no different from those of polls conducted over the past three years that also asked respondents whether they would support or oppose a U.S. strike against Iran to prevent it from obtaining a nuclear weapon. On the question of how the U.S. should react to an Israeli attack on Iran, on the other hand, the latest poll suggested an increase in support for Israel when compared to a Pew Research Center poll just one month ago in which 51 percent of respondents said Washington should “stay neutral” under such circumstances. At the same time, 42 percent of respondents supported Obama’s “handling of the situation in Iran”, while 39 percent opposed. But the PIPA poll, which was conducted during the conference (Mar. 3- 7), probed far more deeply into attitudes about an Israeli strike against Iran and related issues, noted Peter Ferenbach, an expert on foreign policy attitudes and co-founder of ReThink Media, an organisation works with non-profit groups. Indeed, the PIPA poll found that most respondents were pessimistic about the effects of a military strike on Iran’s nuclear programme. Only one in five (18 percent) said they believed that an Israeli military strike will delay Iran’s alleged ambition to acquire nuclear weapons by more than five years. A 51-percent majority said they thought a strike would either delay Iran’s ability to produce a weapon by only one to two years (20 percent), or would have no effect (nine percent), or would actually result in Iran accelerating its nuclear programme (22 percent). Interestingly, those percentages were similar to the findings of a survey of Israeli public opinion on the same question conducted late last month by Shibley Telhami, a fellow at the Brookings Institution and the Sadat Chair at the University of Maryland which co-sponsored the PIPA poll. In a widely noted interview on CBS’ popular ’60 Minutes’ public- affairs programme Sunday, former Israeli Mossad chief Meir Dagan also noted that an Israeli strike could at best delay Iran’s programme. A 51-percent majority in the PIPA poll also said an Israeli attack would either strengthen the regime (30 percent) or would have no effect on its hold on power (21 percent), while 42 percent said the regime would be weakened. Moreover, only one in five respondents said they believed armed conflict between Iran and Israel would last either days or weeks. Three of four respondents said they believed such a conflict would last months (26 percent) or years (48 percent). “One of the reasons Americans are so cool toward the idea of Israel attacking Iran’s nuclear programme is that most believe that it is not likely to produce much benefit,” said Steven Kull, PIPA’s director. Thirty percent of respondents agreed with the latter position, while only six percent accepted Iran’s repeated assertions that it is producing enriched uranium for civilian purposes only. Asked to assume that Iran actually developed nuclear weapons, 62 percent of respondents said they believed the regime would likely use them to attack Israel, as opposed to only 32 percent who thought it would be deterred from doing so for fear of being destroyed in a nuclear retaliatory strike.